The sheer scale of World War II’s Eastern Front is difficult to comprehend. More forces were committed there than any other theater of war in world history. The years-long sieges, brutal POW treatment, scorched-earth battle tactics and unrelenting cold led to 15 million military casualties. And of course, it was just as harrowing for the civilians—the Eastern Front was also the site of most of the war’s concentration camps, death marches and ghettos. It’s a story that can’t be told in just one sitting. That’s why we’ve created “Combat on the Russian Front,” the second volume in our Eastern Front series. Focusing on the war’s middle years, you’ll find inside extraordinary stories of courage, brutality, audacious planning and gritty determination. The year 1943 began badly for the German Army. After his struggles at Stalingrad, German Field Marshal Friedrich Paulus surrendered himself and his Sixth Army on January 31. Powerful sledgehammer blows from an ever-strengthening Red Army began to rock the entire southern flank of Hitler’s war machine. But the key to the entire northeastern shore of the Black Sea was still Novorossiysk, a seaport held by the Germans since September ’42. By 1943, the Soviets decided that it was the time to strike: they would cut off and destroy German and Romanian forces operating in or near the port, whatever the cost. For the next seven months, the beachhead was a bleeding ulcer for German forces. Commanders continued to pour in men and machines to liquidate the beachhead, but the Red Army could not be deterred. In September 10, 1943, they made their final assault. …But how costly was their victory? 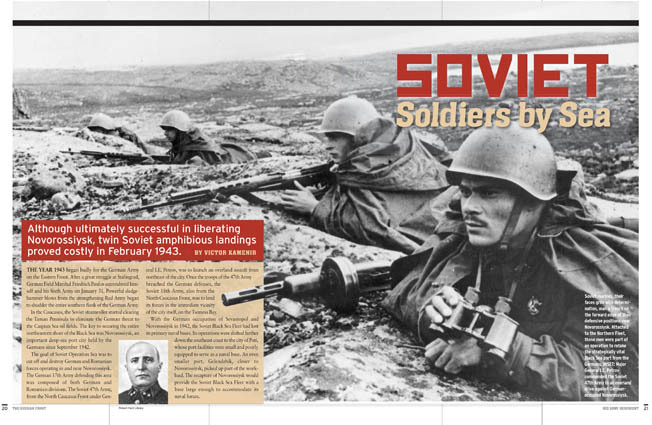 In “Soviet Soldiers by Sea,” you’ll learn all about this epic campaign. About the Red Army’s tremendous sacrifices, and why the engagements at Novorossiysk were taught at Soviet military academies as a shining example of how not to conduct an amphibious landing. So during Hitler’s invasion, partisans were once again relied upon to stall and thwart the enemy. 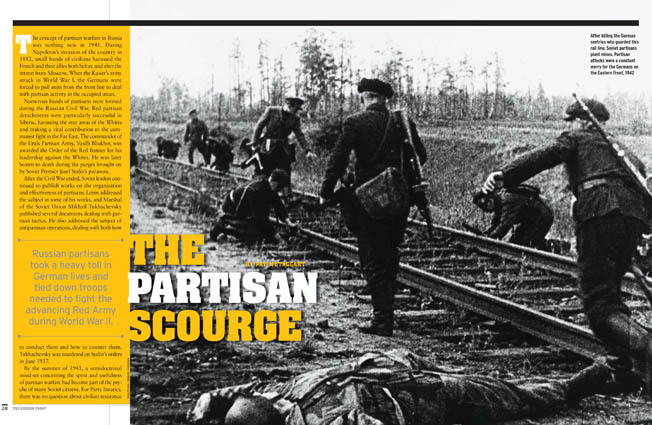 Inside, you’ll read all about the partisan “Rail War,” the massive demolition operations orchestrated by partisan and military forces to destroy over 200,000 sections of track that might be used to supply the German Army. You’ll also read about some of the Soviets’ most prominent war heroes, like teenage Zoya Kosmodemyanskaya. Her story inspired a new level of patriotism and duty to the motherland that resulted in a new surge of partisan volunteers. In the movie Enemy at the Gates, untested Russian infantryman Vasiliy Zaytsev is thrown headlong into the Battle of Stalingrad. In reality, however, Zaytsev had already put in five years with the Soviet Pacific Fleet by then and held the rank of chief petty officer. 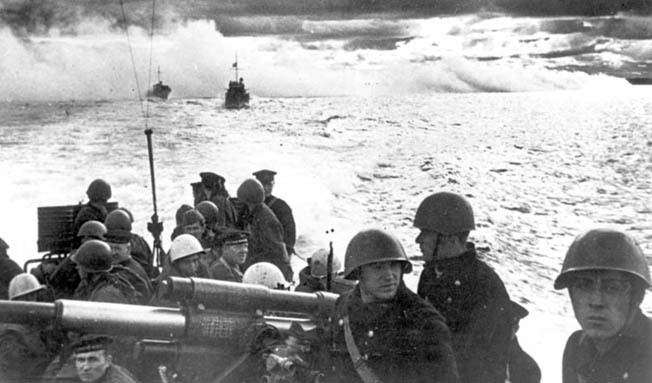 The drastic change in priorities after Hitler’s Eastern Front blitzkrieg caused Soviet high command to transfer large numbers of naval personnel to ordinary infantry. For these men, there was no time to learn their new roles, no training; they had to learn on the job. This of course came with a heavy price tag. Army officers would sometimes command whole infantry brigades of ex-navy men who would all meet their own trials by fire in combat. They were off to a clumsy start, perhaps, but as you’ll find out, the contribution the Soviet Naval Infantry played in their four years of war cannot be understated. They participated in 122 amphibious landings, committing 100,000 soldiers to roughly 30 brigades fighting on land. And we cover their exploits in thorough detail. The middle years of World War II marked the beginning of the end for Adolf Hitler. His advance along the Eastern Front was beginning to stall, and the Red Army would not be turned away. It was a time of massive-scale operations and desperate maneuvers on both sides to maintain their foothold. We hope that from these stories, you’ll learn just how different fighting along the Eastern Front was compared to the West and South Pacific, and why the events in the early 1940s deserve a permanent place in military history.